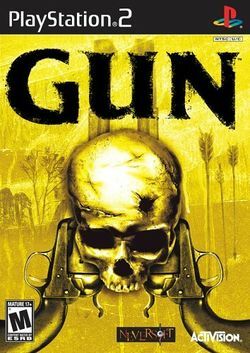 Gun is a third-person perspective shooter game by Neversoft Entertainment. Gun is set in the west in the late 1800s and is a free-roaming adventure game that takes you to a world without laws—where greed, lust and murder run rampant. As Colton White, a vengeful gunslinger, you must straddle the line between good and evil in a showdown against corrupt lawmen, a murderous preacher, renegade army psychopaths, merciless outlaws and relentless warring tribes. Along the way, you'll wage war on horseback, collect bounties and protect prostitutes. Travel through an action-packed landscape of high mountain wilderness, deserts and bustling territorial towns in an epic story of betrayal, greed and revenge. It has many interesting objectives in story mode and plenty of side missions to spare. This page was last edited on 30 May 2016, at 05:26. This page has been accessed 16,447 times.